These charts look absolutely horrible and paint a very bearish picture. I would advise against trying to pick up any longs up this time as this market could really gain momentum to the downside. I’m sure many are hoping for a bounce (including myself) to short more and that logic will probably work against the masses. It would not surprise me to see us down another 200 points on the Dow tomorrow. I’m sure Christian is doing a happy dance after today’s bull slaughterfest and feeling very good about his bearish stance over the last month. I myself would rather take advantage of the up move and the down move and save myself the pain of holding shorts when the market was rising. AMAT could be a stock to that has more downside to go. I’ll be watching it for opportunities to short intraday in the coming days. Thanks for the comic relief, now I have a mental picture of Christian doing his 'happy dance' – in my mind it's the 'running man' for sure. I may be pushing my luck, but I am still holding my shorts – If we get a gap down off the hop tomorrow I'll go to cash and see what plays out from there. He got it right now and with lots on bad news now, there is little reason for the market to go up. 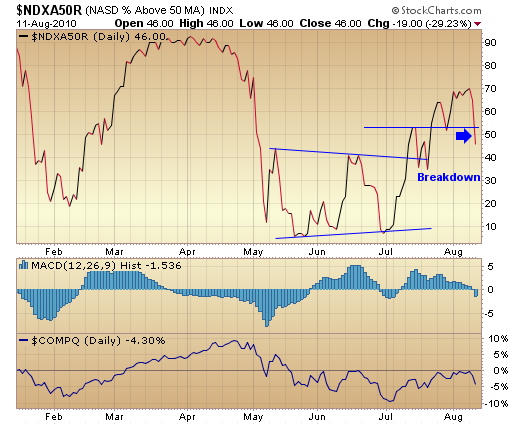 Many charts I scans are pointing toward a downtrend. Newspapers printing more bad news on top of already bad news. The press make it worse; "Desperate villages fight advancing flames near Moscow; Bread prices soar in drought hit Russia; China/Pakistan massive flood and mudslide; Dollar surges over global economic fears; Market facing suicide squeeze; Cramer: Why you should buy gold right now; Art Cashin: Watch this S&P resistance level" and many more Yadi Yada Yadaa. The reporters love to print disaster news at the right time. They are doing their job. I played it short today and picked up some good money on it. There are a lot of good looking shorts at the moment. I'm not entirely convinced the market is ready to roll over yet though. Every time I put on my bear suit and load up on shorts, we seem to head fake and move higher. I'd like to print well below $SPX 1050 before I really begin pounding the shorts. 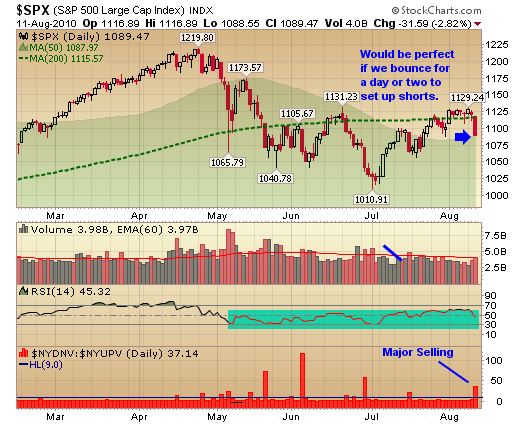 We were at 1050 in Sept. of '09 and we're almost there again in Aug. of '10. I agree that the media in general likes to push 'bad' news at us, 'good' news isn't really worth reporting on for news agencies. However, when it comes to the US market coverage, rarely if ever do they focus on the 'truth' of how bad things are. It's always sugar coating every 'bad' data point or blatantly ignoring how the Fed, state's and cities are all broke and the masses are unemployed. The truth eventually will come home to roost. That being said, I look forward to riding the next 'push' up by helicopter Ben (Liberty 33's PPT)and the HFT bots. Money is money, whether it's made on the way up or the way down. Keep up the great work Jeff, look fwd. to your next post. Good post, Jeff. Maybe you did the Safety Dance by exiting your shorts already. Obscure 80s reference there. FWIW, we're up to 74 new 52 week lows. The Hindenburg omen requires 75. All the other omen requirements have been fulfilled. Here is a good link on the Hindenburg stuff. Some of these requirements seem only tangentially related to a sick market but so be it. And of course this indicator is not perfect. Like everything else in this world, caveat emptor. Pal, I'm not sure that a crash would require another dose of "bad" news. Maybe just more data that indicates a double dip. I think there is still a lot of money in the market that assumes a gradual, if slow recovery. They could be disappointed.